Dubai: Photos and videos of the UAE-Oman border flooded social networking sites as an unusually high amount of vehicles flocked through the town of Buraimi. 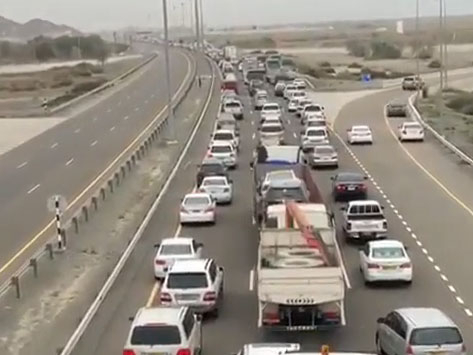 The significantly high congestion during Wednesday and Thursday as Omani residents rushed to the UAE via Al Ain to celebrate the Islamic holiday Al Isra'a Wal Mi’raj, which fell on April 3. The two sisterly countries have shared strong historical relations under the leadership of President His Highness Shaikh Khalifa Bin Zayed Al Nahyan and His Majesty Sultan Qaboos Bin Said of Oman. In January, the Roads and Transport Authority (RTA) in Dubai launched three daily trips to Muscat in partnership with Mwasalat, Oman’s national transport company. Since the establishment of the UAE Federation in 1971, the momentum in the cultural movement in both countries has been increasing, driven by the signing of several educational and cultural agreements. The free movement of Emiratis and Omanis between both countries have also been on a steady rise as citizens can use ID cards instead of passports when crossing the border. With regard to tourism, Oman remains one of the most important destinations for holidaymakers from the UAE either by air or road with millions of visitors moving freely between their respective borders.